Today I’m looking at a new binary options trading indicator built for the MT4 platform, the Binary Destroyer. According to the sales page, the developers dealt with many binary options signal providers over an extended period of time that more table to deliver the results they were providing. They then felt that they should take their own knowledge and apply it to the markets, and provide traders with a real opportunity. The creators of The Binary Destroyer Ltd are Jamie Palmer, and Michael Vert. Their offices are located at 259 Welland Park Road, Market Harborough, Leicestershire, LE16 9DP. They are a registered company in England and Wales with the registration number of 10856999. To get in touch with either of the developers, or the support team, traders can email [email protected] or call 01858 464024. Jamie and Michael claims that after around 12 months of consistent profits with their price action-based indicator, they felt it was ready for the marketplace. 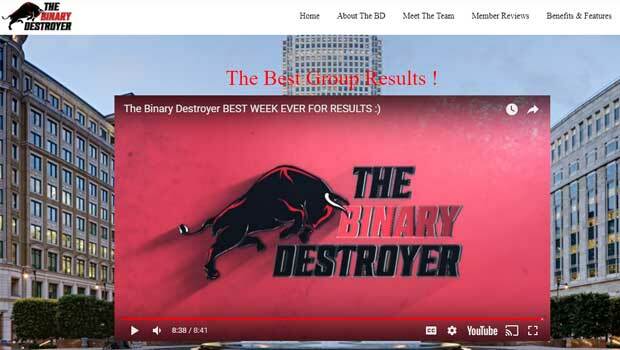 “The Binary Destroyer is an MT4 template that can be used to trade both Binary and Forex from short term trading to long term trading.” Outside of these statements, there is no other information about the indicator and how it works. I would really like to know what pairs and time frames the system works on, and how they are using price action to provide trading signals. At this point in time, the sales page does not provide enough information on the software. The developers do have a Facebook channel, and a YouTube channel, but I haven’t seen any real discussion about the strategy in either of these social networks. Along with the MT4 binary options indicator, the destroyer package also comes with lifetime support, unlimited updates, one-on-one trading, video tutorials and unlimited coaching. The software is moderately priced, and there are quite a few videos showing how it can work, but most of them are focused on promotion. Hopefully, we can get a little more information about what expiry times and pairs this strategy works best on. I generally don’t like getting involved with the system before I know the type of approach, and the type of signals I’ll be receiving. In the past, I’ve signed up with trading systems to find out that they only work with 60 second trades, and that’s essentially just gambling. There doesn’t seem to be any trading results on the Binary Destroyer website. Considering the indicator has been on the market for approximately 8 months, I’m surprised that the developers haven’t been able to keep track of their wins and losses. Many of the videos may claims of winning percentages in the 80-95% range, so I’m not sure why there are no results to corroborate these numbers. Instead of trading results, the developers focus more on member reviews which come in the form of cell phone screenshots of text messages, and messages from Facebook messenger. While some of these reviews are impressive, with traders claiming to win 11 straight trades on their first day of using the indicator, there is nothing that suggests that the system can perform consistently in the long term. Are only recommend the developers start keeping track of their wins and losses, over an extended period of time so that we can see exactly how the software trades, and then determine from this information if it’s the right system for us. As is the case with many of my reviews, the Binary Destroyer seems to be lacking in 2 main areas. They do a poor job at explaining the strategy, and don’t provide us with any real verified trading results. That doesn’t mean that this is a scam, or something that should be totally avoided, but it’s clear to me that more information needs to be made available before I can consider signing up. Hopefully, the vendors will provide us with more trading results and information about the strategies moving forward. Thank you for reading my review, and please leave a comment if you have anything you would like to add. Jamie Palmer is banned from being a company director… look it up on company’s house website. Also what company asks for payments of goods through western union? I used western union payment and it was quick and easy. Support got me joined and activated within a day. I can’t use PayPay so it was easy for me. Hello John,You are doing great job in your reveiws,I would be glad if you could reveiw Newgen trades who offer two indicators Korvo for binaries and Korex for forex. I’ll take a look Kolwane. Thanks for the kind words. I received my copy of the BD 5.0 yesterday and managed 4-0 on my first day 😁 not sure if that is beginners luck or not but it’s a great indicator for sure. The last 3 comments from Muhammad, Nick Harman, and Tashi are all from the same IP address. This means it is likely someone with Binary Destroyer posting fake review. Please be careful. Wow thanks for that heads up. As Hamilton put it. the indicators are free. This means the sellers of BD are doing something wrong, it is a rule in this market to acknowledge the work/source of a product. Also it is a requirement to get permission from the original creator before commercializing such products. I have learnt alot from the Binary Destroyer and would recommend it to everyone! I just ordered the BD 5.0 two days back. Email sent, FB messages sent, proof of payment sent yet no reply from the admin. I am still waiting to hear from them. I joined about four months ago and its really helped my trading. Great support and training and the new FX Learning will be a great addition to the group. Free? Where can I find it? @Peter what web forums? can you give me link? Ive had the BD for a little while and it does work. I have better results based around the 15 min time frame personally but it works on all time frames & currency pairs. Nice to see a few other members posting their comments on here, especially Marc who is definitely one of the best traders I’ve seen who use this indicator and his own strategy which he shares in the FB group is spot on. I have been using this indicator for a few weeks now and it is incredibly helpful when trading price action. Its excellent on its own following the basic rules but when implementing personal strategies and adding in the BinaryToday indicators, it becomes a revolutionary tool for trading binary and forex. It certainly changed the way I trade and boosted my ITM% to new heights. The only complaint I have about this system is the way it is sold, it takes days and several emails to get it all set up and running. Nice, but how did you purchase it? There is no payment link on their site except a Paypal photo. I contacted them twice and no any response from them till now. Any suggestions? Your post really motivated me. Ok I did, I am expecting their reply. Hello John Kane, I have owned and been a part of the Binary Destroyer and its a really good group to be a part off. The support and training has really helped me and the indicator is amazing. I only gave up with trading because of my poor eye sight staring at the pc for a long time. I would highly recommend it though. I’m glad to hear that Marc. Can you please provide some guidance (e.g Links) on these binary destroyer, I am trying to test it. Watched some YouTube videos but not much helpful. You need to make sure you buy through Jammie’s link. Its a great indicator but even more powerful when used with simple price action like support and resistance, M % W pattern. Great tool indeed?